Professors in my Historic Preservation Masters Program lectured us time and again that the Preservation industry is an aging one, in desperate need of a youthful injection if it is to continue. During a Preservation PR class, canvassing websites for preservation organizations, most looked out of the 1990s. Text was haphazardly strewn about in large and tiny font sizes. There were multiple calls to action. Photos were small and randomly spaced. The closest thing to social media links were icons for Blogspot. How do you take an industry, whose roots are in a bunch of old white ladies (I'm looking at you, Mount Vernon Ladies Association) getting together to save the home of an old white guy (oh hey, George Washington), and make it matter to younger generations? How can it modernize and engage? The National Trust for Historic Preservation started the This Place Matters campaign in 2008 to shine a spotlight on the historic places that matter in individuals' lives. Viewed as a success, the campaign made history and historic preservation personal. Other preservation organizations are creating events and initiatives that highlight the importance of history and preservation in a way that appeals across generations. 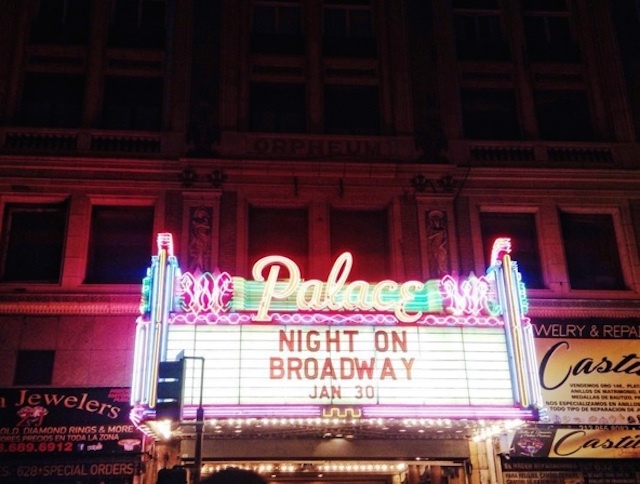 Los Angeles' recent Night on Broadway comes to mind, creating a festival atmosphere designed to encourage historic preservation and revitalization of the city’s historic downtown theater district. But even with a cross-generational event like this, are attendees aware of the underlying cause represented? Has it been contextualized for them? Does it matter to them? If historic preservation and conservation groups think that starting a Facebook page means they can check off the 'modernize and engage' box, they’re wrong. Today, virtually everyone's grandmother has a Facebook page. In the world of social media outreach and engagement, organizations are going to have to, at least, one-up grandma. Even still, for organizations with website content that hasn't been updated since 2000 (or 2010), a Facebook page that few people engage with, or an Instagram with visually unappealing photos, they're failing the very demographic who can ensure their future - and preserve everyone's history. Convincing a new generation that this place matters? STRUKTR tells stories of heritage, architecture, and preservation in a way that's relatable for a new generation. Our blog content, videos, press releases, and copy are smart, form an emotional connection, and are sometimes (often) a little irreverent. Our streets, neighborhoods, buildings, and homes already have wonderful, curious stories to tell. So all of us readers and consumers connect with architecture -- a lot more than we even realize. Plus all of our work fits within a greater story, never a vacuum. It's about context. Work with STRUKTR today to bring your preservation initiatives to a new generation. Night on Broadway celebration, Downtown Los Angeles. The festival was part of the larger Bringing Back Broadway initiative.